NSW is set for another road safety blitz that will see more than six thousand kilometres of vital road safety work delivered by the Liberals & Nationals Government, as part of the next round of Saving Lives on Country Roads funding. Deputy Premier John Barilaro joined Minister for Roads, Maritime and Freight Melinda Pavey to announce a $182 million boost to road safety that will significantly improve road safety and help reduce the road toll. “We are serious about reducing the state’s road toll and this unprecedented funding will help prevent the loss of lives and serious injuries incurred from road trauma across our state,” Mr Barilaro said. Minister for Roads, Maritime and Freight Melinda Pavey said improvements include installing 113 kilometres of safety barriers, 3000 kilometres of rumble strips and 2800 kilometres of wide centreline to prevent run off road and head on crashes. “Last year, there were 26 fewer fatalities on country roads than in 2017. While this is encouraging, it’s important not to become complacent. We are committed to building safer roads, but safety is a two way street,” Mrs Pavey said. 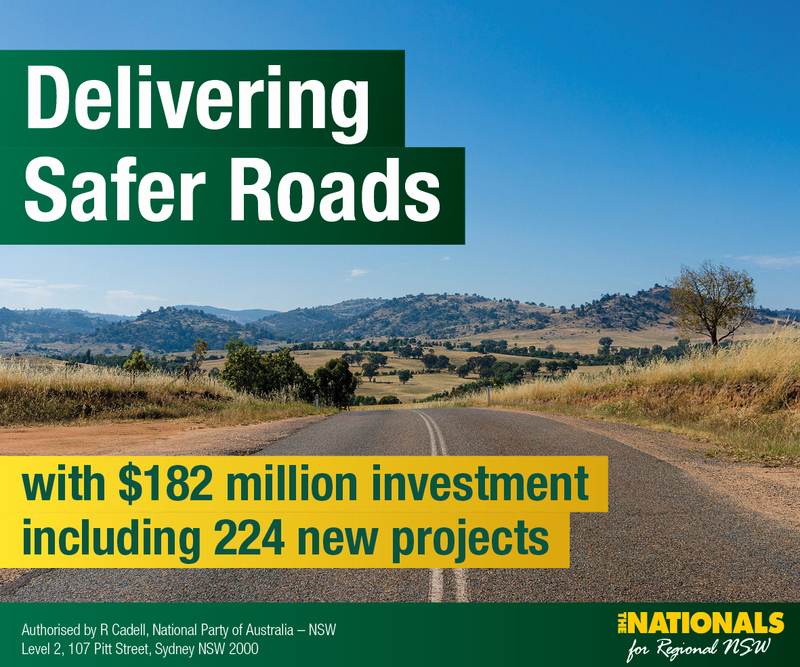 The Liberals & Nationals in government are investing $1.9 billion over five years to deliver the Road Safety Plan 2021.This includes $640 million for Saving Lives on Country Roads and $180 million for Liveable and Safe Urban Communities.